And December 4th-14th was a lot like that. I don’t even know what I did. I didn’t watch TV or anything. I just didn’t read. But then, starting with that book that I picked out my roommate’s book shelf, I’ve read a strict of very smart, witty ‘young-ish person in the big city’ books. 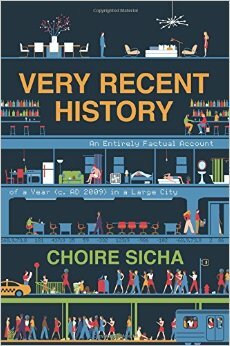 The weirdest of this set has to have been Choire Sicha’s Very Recent History: An Entirely Factual Account of a Year (A.D. 2009) In A Large City. This book is amazing. The conceit is that it’s told in a very distant, historical tone, as if someone from another time and place is trying to describe what it was like to live in New York in 2009, so they explain lots of things in a funny way. Actually, it’s alot like if someone had written a science-fiction novel about the present day. I mean, you know how sci-fi novels are always explaining stuff about the technology and the culture of a place even though those things would be utterly unremarkable to the point of view characters. Things like, “Qu’Fenuwan took out the carbon-3 blaster pack from his Selzner ray gun, because the blaster pack emitted harmful ZuYang radiation that would turn his fingers into octopuses if he didn’t encase them in the lead gloves. The government had tried to ban the blaster packs for this reason, but the people had taken to the street in violent protests to…” You know. Honestly, I enjoyed the descriptive passages (like the ones where the book tries to describe the economics and governance of the big city) even more than I enjoyed the narrative. And the book does have a narrative! It’s about a dizzying array of gay men who party down in the big city and sleep with each other and fall in and out of love. It’s a very stereotypically gay big-city milieu, but there’s also a lot of tenderness. These guys are looking for love and companionship, in their own way, and it’s interesting to see how they create their own sort of relationships and craft their own approach to fidelity. The narrative is very low-key, but I liked it alot. Other big city books that I’ve recently read and enjoyed: Amy Sohn’s The Actress; Meghan Daum’s My Misspent Youth; and David Shapiro’s You’re not Much Use To Anyone. Right now I’m reading Wonder Boys, by Michael Chabon, which is fantastic. He’s an extremely readable writer.